Queenstown is the most popular winter playground in New Zealand, famous for its world-class skiing and unique snowboarding. 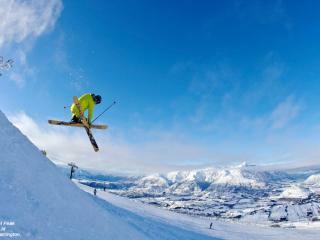 There are a number of Queenstown ski fields just a short drive from the centre of town that offer fantastic skiing and snowboarding as well as an exciting range of other winter sports and activities. With ski slopes to suit all skill levels and abilities, the following Queenstown ski fields also offer a number of family friendly options including, snow shoeing, ice skating and even the opportunity to take a snow mobile for a spin. See the map. Offering world class parks and pipes, Cardrona is conveniently located within an hour of Queenstown and boasts some of New Zealand’s best learning facilities for kids. Accommodation is available on mountains, and the ski field offers plenty of wide open beginners trails as well as fun freeride terrain and pristine groomers. The ski field caters to all abilities and skill levels offering a challenge no matter your experience. An icon in the Queenstown ski scene, Coronet Peak is just 20 minutes from the city and features 280 hectares of skiing terrain. Boasting a range of state-of-the-art facilities including 213 snow guns, Coronet Peak also features an alpine resort and a great range of facilities at base lodge. 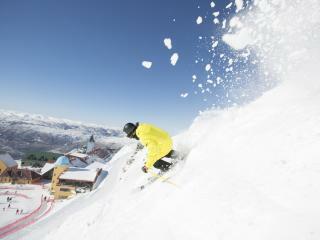 With some of the longest opening hours of any New Zealand ski field, Coronet Peak offers the ultimate ski experience. The best family friendly ski field in New Zealand, The Remarkables are located just 40 minutes from Queenstown and also boast some of the best learning facilities in the whole country. Although there is no accommodation here, it still manages to be one of the most popular ski fields and boasts outstanding learning facilities and instructors as well as dedicated children’s zones and a restaurant overlooking the learning area. Voted by the World Ski Awards as New Zealand’s best ski area for two consecutive years, Treble Cone is also the largest ski area in the South Island. Famous for its uncrowded and long groomed runs, Treble Cone enjoys spectacular views of Lake Wanaka and the Southern Alps. Offering a variety of terrain to cater to all skill levels, the ski field is conveniently located less than an hour from Queenstown.